Go means five in Japanese but the dish is by no means limited to five ingredients. Gomoku was inspired by the Japanese chess game of go. At the beginning of the game five stones are set on the board. As the game progresses more stones are accumulated. So start with some basics like dashi soup, kombucha (kelp) tea, soy sauce and sake wine and add ingredients you treasure to your gomoku rice. In Japan, cooked chicken is often included. The Ninja Baker's gomoku is adapted from a recipe seen at Cookpad.com. Soak the dried shitake mushrooms in water for 30 minutes. Pat dry with paper towels. Do not discard the liquid. Drain the liquid through a paper towel lined strainer into a bowl. Cut the mushrooms into thin slivers. Boil water and make kombucha tea. Warm the sesame oil in a pan over low to medium heat. Stir-fry the carrots, corn, mushrooms and tofu. Into a rice cooker, place the 4 cups of rice plus the water, liquid drained from the mushrooms, sugar, hondashi, soy sauce, sake wine, tea and the stir-fried ingredients. Cook according to manufacturer’s directions. (50 minutes in the Ninja Baker’s rice cooker.) 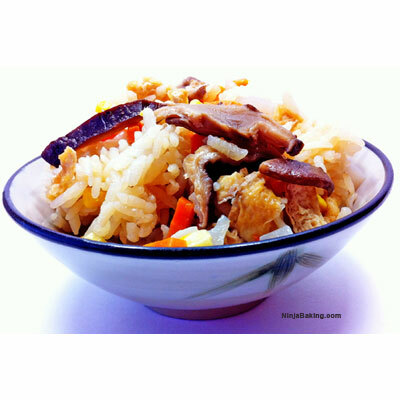 If you don’t have a rice cooker, this recipe should work well with rice made on a stovetop.